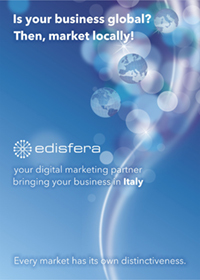 Edisfera, a limited-liability company based in Roma and offices in Sardinia, was founded in 2005 and was set up by a network of professionals with an extensive experience in national and international well-established company contexts. Our team is specialized in managing complex projects in the fields of corporate and brand communication, eMarketing and eBusiness. 2005-2015: 10 years together. Watch the video. A partner always on with a win-win approach. edisfera mission is to offer ourself to our Clients as a partner and a business companion always ON, with a project approach capable of providing together consulting, assistence, flexibility as well as personalized services and solutions. We believe each client and project is unique and the only possible collaboration strategy is through a win-win approach, where client satisfaction and success are reason of winning and growth also for edisfera. Our customer center philosophy bring us to offer support also after the delivery of a project, establishing a professional relationship of mutual collaboration that with most of our customers continues for years.